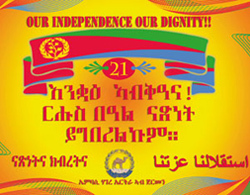 Happy 21st Independence Day Eritrea! | .:TesfaNews:. It is a great joy to see its celebrations grow. This day speaks so much to us; it has a powerful affect on us it has a strong voice. This day is also full of emotions that speak for themselves. This day is like a living thing for us Eritreans. It feeds on our joy, proud determination, and greatness we develop on this very day. Congratulations to all Eritreans, this day speaks volumes of the heroic struggle we had to wedge to get to this point. I hope this day will be an everlasting moment because this event is so special that you cannot even define it. It has a deep meaning that is kept in our hearts, no words can define it but our actions are doing the definition. It has been 21 years since that first and special May 24. Twenty-one years of independence and what we were able to do in this short period also shows our brave determination and our wisdom. The way we celebrate Independence Day also shows our national character and devotion. People have different opinions on what Independence Day is. Independence Day is definitely a time of joy and endearment. But there is way more to this; it has a stronger power and motivation lift. Days like our dear Independence Day should be defined with much care. You can write a book if you were to define Independence Day because it has a meaning that has as much life as a human being. Independence Day is a day of infinite happiness that represents a special day of celebration. But when I think deeply about Independence Day, there is a tingly feeling that gathers my emotions and brings up memories. When I say memories I mean how we Eritreans got to this dear day of celebration. How we gained our independence. It is a long story of sacrifices and pain but at the end we got our dream of independence and that is why we now celebrate with passion. It was a continuous sacrifice of young Eritreans, very humble and dedicated citizens that gave Eritrea its precious Day. Everyday they were going through hard time and the horrors of war but they kept going like supermen for the sake of the country and its population. They went out in the battlefield and sacrificed an ample amount to liberate our country. This took a lot of determination and hard life but our brave fighters did the impossible; they defeated a vicious enemy, with powerful friends and unlimited resources. This shows what type of fighters we had and the steely character our martyrs had. This and many other things is what I think when I think of Independence Day; its meaning, as I said, is far deeper. We have to think on how we got to this point whenever we celebrate Independence Day. Now each year as we celebrate Independence Day, we sometimes dance and we celebrate it in different ways. While we show our joy, let’s never forget those that passed to make Independence Day possible and those that are still alive and those that are defending it. Let’s ask: what about our fighters? How have they been in the past 21 years of independence? This was a concept Sium Grippi, a great person who speaks powerful words, reached when he was talking about Independence Day. He touched the hearts of many Eritreans. While we are having the best times of our lives, let’s ask what is happening to the people who made this happen. Are they having a good time as well? During the war it was young people who sacrificed their lives to fight in the dreadful war; many of them were in their late teens. Now teens in the west usually go through a smooth enjoyment of going to college and getting a degree, job, and family. We need to stop and think of the Eritreans whose lives were dedicated to fighting in the war for independence, whose lives saw nonstop violence and horror. Let’s remember the fighters who were forced to bury their fellow fighters saying “Awet Nahafash”. Imagine a life like this at the age of sixteen. The war has given us many disabled veterans. Many veterans who cannot walk, talk, hear, or see; and many more with minor and major other disabilities and all with scars of war. Imagine the internal and external pain that these great heroic fighters are encountering day and night. These brave sons and daughters of Eritrea are still carrying their physical and mental pain to make sure the independence they fought so hard for becomes meaningful. They are still in a mindset of avoiding pain for the sake of their country. Our dear liberators have already done a lot and it was time for them to take a break and enjoy, but they cannot yet celebrate fully because they feel they still have lots of things to do. Many of the disabled are also not able to see or enjoy what the majority of us are enjoying. This is unfortunate and sad; those who deserved to enjoy Independence, because of their disabilities are not able, and those who should have got a break are still sacrificing. One of these people, who are going through this, is named Mohammed a person Sium Grippi talked about in his Nakfa speech. Think about it as Sium Grippi said. 21 years of nonstop pain. For us 21 years is a few hours because of our enjoyment. But for people like Mohammed it has been 21 years of a living in a nightmare that will not stop until they die. It is so hard for humans to experience, but our dear fighters have been through it for 21 years. It is a painful sight to imagine. So as we celebrate Independence Day let’s do our best to keep the legacy of our dear fighters. Let’s try to step in our brave father’s footsteps so we can ensure independent Eritrea prospers so that it can begin paying a fraction of what these brave children gave it. Our dear Warsay have been keeping their dear promises of continuing their duties to develop the country. They have put their lives in the work of reconstructing our dear Eritrea and making it better. They have been doing what our dear fighters did long ago to liberate us. They are protecting us at the same time building our country. They are continuing to make our country more independent and strong. What about the rest of us? Let’s think of this as we celebrate Independence Day. Happy 21st Independence Day Eritrea! This entry was posted in News, Opinion and tagged Eritrea, eritrean 21st independence day, eritrean development, eritrean independence day, Ethiopia. Bookmark the permalink.